The Continental Group Realty’s (TCGR) hospitality division is offering “Escape to Estero Island 1, 2, 3, Free!” winter package for a getaway to one of Southwest Florida’s Gulf of Mexico destinations, Estero Island, where magical sunsets are just one of the attractions © 2012 Karen Rubin/news-photos-features.com. The Continental Group Realty’s (TCGR) hospitality division is offering “Escape to Estero Island 1, 2, 3, Free!”(stay three nights get the fourth night free) winter package for a getaway to one of Southwest Florida’s Gulf of Mexico destinations, Estero Island, popular for couples and families, alike. The offer is available on SandalsInTheSand.com (check the website for availability). The Sandals in the Sand “Escape to Estero Island” winter vacation package offers visitors their choice of three beautiful resorts located on breathtaking Estero Island: Seaside All-Suite Resort, Casa Playa Beach Resort and Cornerstone Beach Resort. Just north of Naples, Estero Island offers miles of white, sandy beaches along the beautiful Gulf of Mexico and is complete with extraordinary sunsets, exceptional shelling and nature preserves, plus great dining and luxurious accommodations that attract visitors worldwide. Marinas throughout Estero Island are great for boating adventures including romantic sunset cruises, sightseeing cruises and deep-sea fishing. For nature lovers, just cross a bridge at the southern tip of the island and you can escape to Lovers Key State Park – a harbor for wildlife and home to West Indian manatees, bottlenose dolphins, roseate spoonbills, marsh rabbits, and bald eagles. The Seaside All – Suite Resort, located in the middle of Estero Island, is rated number three out of 20 on Trip Advisor’s popularity index. This resort offers 50 suites each equipped with two bedrooms, a large inviting living/dining area, a fully equipped kitchen, two full baths, a heated pool, and a private screened in lanai that lets you enjoy the warm tropical breezes and dine al fresco over spectacular sunsets. View details at www.seasideresort.us/ or call toll free 888-226-6555. The Casa Playa Beach Resort is an all-suite resort located on the exclusive north tip of Estero Island. The 35-unit resort condominiums are each privately owned and individually decorated. All suites have private balconies and high speed wireless Internet. Casa Playa resort offers two pet-friendly designated floors, a heated pool, picnic area, gas grills, beach lounge chairs and a serene private beach area. 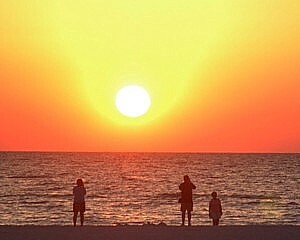 For more information visit www.casaplayaresort.com/ or call toll free 1-800-569-4876. The Cornerstone Beach Hotel, located mid-island, has 12 elegant, non-smoking one and two bedroom units all with incredible views of the Gulf of Mexico. Suites include a fully appointed kitchen, bedrooms, bathrooms and screened lanais. All contain flat panel televisions in the living room and bedrooms. Beautiful views can also be enjoyed while swimming and sunning by the heated Gulf front pool. See details at www.cornerstonebeachhotel.com/ or call toll free 1-888-226-6555.